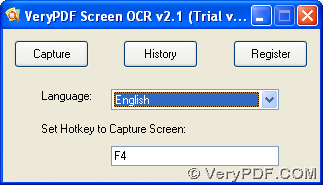 VeryPDF Screen OCR is a powerful tool that can help you OCR screen text quickly and accurately in Windows systems of both 32 bits and 64 bits. For more information about this process with OCR technology, you can keep reading this article to find more. 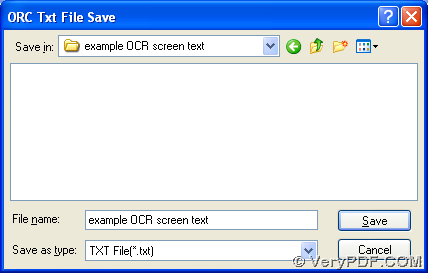 VeryPDF Screen OCR helps you capture screen and save to image, recognize text displayed on screen and recognize text from existing images. More knowledge of VeryPDF Screen OCR could be found at homepage of VeryPDF Screen OCR. Here you can also free-try VeryPDF Screen OCR. To know other software, please go to official website of VeryPDF. 2. Please use your left button of mouse to drag a rectangle on your screen above what you want to OCR later, then release your left button, there can be a rectangle appearing with 4 buttons – cancel for discarding this rectangle, copy for coping this screen, save to file for saving screen snapshot, OCR for OCR screen text. So we need to select OCR button here. 3. Then, there will be 2 panel popped out, where you can notice screen text has already been extracted successfully. And all you need to do is to save produced text: click File > select save text as > select folder in dialog box > click save or just click directly which offers you the same proceeding. Is it very conveniently and simple to operate to OCR screen text with VeryPDF Screen OCR? For more concerns about VeryPDF Screen OCR and how to OCR screen text with OCR technology of VeryPDF Screen OCR, please feel free to contact us through your comments left here or just directly contact support team of VeryPDF.